Are you looking for a new outdoor smart camera but you can’t decide? In this post, I compare the Blink XT vs Ring Stick Up vs the Nest Outdoor Camera. I look at how they are the same and how they are different. Let’s start with a chart that shows the main differences between these three cameras. Blink XT offers 1080p resolution and an example of its clarity in daylight can be seen in the picture below. The Ring records footage at 720p and the difference between this and 1080p is very noticeable. As you would expect, details aren’t so precise, edges are slightly less sharp and colors aren’t as deep or vibrant. I have included a sample snapshot for you to take a look at. The Nest records footage in 1080p and the picture quality from this camera is amazing. As you can see the quality of the colors is very good. This security camera has a field of view of 110°, which is fairly large compared to most other outdoor security cameras- apart from perhaps the Nest or the Arlo! However, in most situations, it provides enough coverage to meet most people’s needs. I am thinking here in terms of placing it on a front porch, on the back of the house or at the front or side of a garage. It just means that you need to think more carefully about where to position the camera and ask yourself where the most important area is that you want to monitor. This camera’s field of view is woeful. It is only 80°! There are few other security cameras on the market that have as narrow a view as this camera. And I think that this will be a deal breaker for many people. With such a narrow field of view, it just means that this camera is only really suited to monitoring a very small or narrow space and that you need to position it very precisely. And, of course, you can be slightly more relaxed about its position. All three of these security cameras have motion detection but only two of them have motion zones. Motion Zones are selected areas within the field of view that can be monitored separately. The Blink XT doesn’t have the motion zone facility. The Ring Stick Up Cam uses Motion Zones, as you can see from the image below. The Nest Outdoor labels its motion zones as “Activity Zones”. However, activity zones will only work if you subscribe to one of the paid cloud storage plans, which I will discuss in more detail later. Ah, the great promise of battery power! The XT is powered by two AA size batteries, which are provided. The official line is that these batteries will last for two years. Two years?! To be more precise the battery life is for the camera to be able to record 40,000 seconds (or 667 minutes) of video. Over two years, that is less than 1 minute of recording per day. The Stick Up can be powered in a number of different ways. It has a built in rechargeable lithium ion battery. Ring claim that the battery will last up from 6 months to 1 year on a single charge but many users dispute this. Ring themselves have responded to these frustrations by listing a number of factors that will affect battery life. Many users need to recharge their batteries after 2 months. However, the Ring does have an impressive range of alternatives. The Stick Up Cam comes with a power supply that can be left plugged in. However, in order to use this, you will need to place your camera near to an external socket. The Ring Stick Up Cam can also be powered by a solar panel, which needs to be purchased separately. The Nest camera can only be powered using its power adapter. It has no internal rechargeable battery neither can it be connected to a solar panel. The good news is that its power lead is 25 feet long which gives a bit of flexibility in terms of the camera’s placement. The Blink XT has limited storage options. It does not offer any local storage options such as a micro SD card or USB stick. It only offers 2 hours (or 7,200 seconds) of free cloud storage- there are no other cloud storage plans, paid or otherwise. Motion clips can last between five and sixty seconds- this setting can be adjusted in the Blink App. 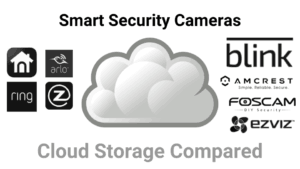 The Stick Up Cam, like all other Ring products, offers two different paid plans for cloud storage. Each plan will store your footage for a whooping 60 days. The first plan costs $3 per month or $30 per year per camera. The second plan costs $10 per month or $100 per year for unlimited cameras. This camera only uses cloud storage. There are three different plans; 5 days, 10 days and 30 days. The cost of each plan is based on 1 camera but there are discounts for using multiple cameras. 5 days- costs $5 per month or $50 per year and stores footage for 5 days. 10 days- costs $10 per month or $100 per year and stores footage for 10 days. 30 days- costs $30 per month or $300 per year and stores footage for 10 days. The Blink XT is different to the other two cameras in this comparison because it doesn’t connect directly to a WiFi network. Blink cameras connect to a sync module (smart hub) first. This sync module then connects wirelessly to a WiFi network. This camera connects directly to a WiFi network but it can only connect to 2.4 Ghz networks. The Nest camera connects directly to a 2.4 Ghz or a 5 Ghz WiFi network. 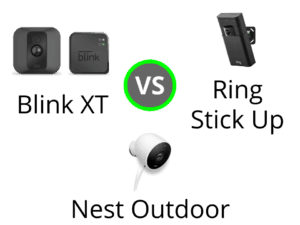 Now that we have discussed the many ways in which the Blink XT, Ring Stick Up Cam and the Nest Outdoor are different, let’s have a look at their similarities. The Blink XT will only send you motion detection alerts via the Blink app. Unlike other security cameras, you cannot be alerted via email. Motion detection can be enabled or disabled. Sensitivity is an adjustable scale between 1 (low) and 10 (high.) It decides how sensitive your motion detection is. The lower the settings, the fewer the events that will be detected and the nearer to the camera a motion needs to be. In my own experience, by setting the scale to 9, motion could be detected up to about 40 feet away but at this range it would only detect fast movements. Adjusting the scale to 5 leads to a detection range of 25 feet and fast and slow movement would be detected. For instance, if the “retrigger time” is twenty seconds, the camera will wait 20 seconds after a motion event has ended before triggering another event. Clip length The scale is from 5 seconds to 60 seconds. It decides the duration of the video clip that the camera takes after a motion event. Enable or disable motion detection. Like the Blink XT, this Ring camera will only use its own app for motion alerts and not email. And the sensitivity of the alerts can be controlled via a “Range scale” which is seen in the image below on the left hand side. Another feature of the Stick Up Cam’s motion detection is the smart alert feature, which controls how many alerts you will be sent. You can choose between Light, Standard and Frequent. And what are the most important features of the Nest Cam’s motion detection? Nest can detect motion and sound events and these alerts can be switched on or off. Notifications will be sent in the app or via e-mail. Well, the Nest cam will alert you if there are any motion or sound alerts but its real power features are available only if you subscribe to one of the cloud storage plans- Nest Aware. There are three plans which cost from $5 per month. 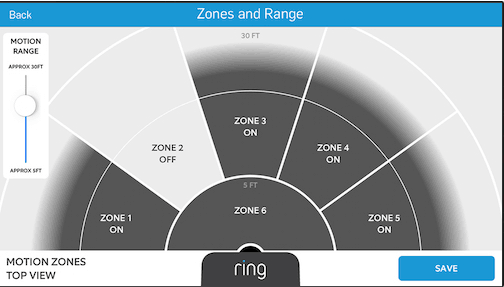 Activity Zones- Nest’s equivalent to Ring’s motion zones. Person Detection- You will be alerted if a person has been detected in one of your motion events. Neither the Blink XT or the Ring Stick Up Cam have person detection, even in the case of Ring you were to sign up to a cloud storage account. All three of these security cameras can be controlled via apps for your Apple or Android devices, although there is a difference in control using a traditional browser. If you want to connect with and control your Blink XT from your iPhone or iPad, just make sure that it is running iOS version 9.3 or later. Unfortunately, you cannot access your camera from a standard web browser although lots of Blink customers would love it if they could. Well the good news here is that compared to the Blink App, the Ring app will work on slightly older version of your phone’s software. It gets even better because you can connect to your Stick Up Cam via a web browser, such as Firefox, which is great news for laptop addicts like myself. With this Nest camera, the situation is slightly more confused for Android users. This is because, the version of Android that your Nest app needs to successfully run, depends on the device itself. So, if you are in this situation, launch the Google Play app on your phone and search for “Nest” and it will let you know if your device is compatible. iOS fans need to make sure that their Apple device is running version 9 or later. And your Nest camera can be access via a good ol’ fashioned web browser, which is great news for dinosaurs like myself! All three of these cameras are weatherproof and suitable for use indoors and outdoors. However, only two of these cameras have a industry wide, weatherproof rating called an IP rating. This camera has an IP65 rating. An IP Rating is a standard measurement of how weather resistant a device is. The first number indicates how dust proof a device is and it is measured on a scale of 0-6. 6 indicates that a device is totally dustproof. The second number indicates how waterproof a device is and it is measured on a scale of 0-9. 5 indicates that a device can withstand gentle or light sprays of water. The Ring Camera does not have an IP Rating, which is a real surprise, and I think a real weakness. It is weather resistant though and can operate in temperatures between -20° and a 120° F.
Like the Blink XT, it has an IP rating of 65, which means that it is totally dust proof and fairly waterproof. It can operate in temperatures between -4° and a 104° F, which is slightly less than the Stick Up Cam. What makes this security camera unique is that it is weather proof, powered by AA batteries and is free standing, which all make for a camera that is easier to move around. Other advantages of this camera are that at 110°, it has a good field of view. Its most unique feature in this comparison is that it doesn’t connect directly to a WiFi network but instead connects to its own sync module. I think that this is a disadvantage! 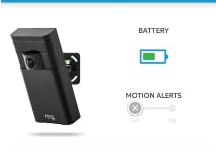 The Stick Up Cam is unique in this comparison because it can be powered by battery and/ or power lead and/ or solar panel. This flexibility is very useful for a buyer who wants to position a camera in an area where there are no electrical sockets. Other advantages of this camera are that it connects directly to WiFi and it offers some good value cloud storage options. Unfortunately, this camera also has a few disadvantages such as poor resolution, a limited field of view and no IP rating. And so finally to the Nest. It is truly unique amongst this comparison because it can connect to a 2.4 Ghz and a 5 Ghz WiFi network, which makes it a great choice for a buyer who has is running a 5 Ghz WiFi network. It also has some very powerful detection features, such as person detection, if you sign up to its cloud storage plan. Other advantages to this smart security camera are its 1080p resolution, 130° field of view and its IP rating. The only feature that I would label as a weakness is perhaps the fact that its only source of power is via a power adapter. And finally to finish off this comparison post between the Blink XT, Ring Stick Up Cam and the Nest Outdoor camera I will take a look at the set up procedure for each camera. The video below demonstrates 16 steps to setting up the Blink XT. Step 10: Exit the Blink App and Select the Blink XT network in your settings. Step 11: In the Blink App, select the WiFi that you want to use. Congratulations your sync module is added. Step 13: Tap on the camera icon to add a camera. Follow the in app video that demonstrates how to install the AA batteries. Once installed, your camera should blink red. Step 16: Take a snapshot of your camera. Your camera is ready to go. Ring have created a video that contains 14 steps. Step 6: From the choices on screen, tap the device that you want to setup. Step 9 Press and release the orange button on the back of the Ring Stick Up. Step 10 Tap continue (in the app). Step 11: Go into your phone’s settings and within the WiFi menu, select “Ring” and wait for it to connect. Step 12: Open the app and the Ring Stick Up will scan for your WiFi network. Step 13: Tap your network and enter the password. Step 14: Tap continue. A congratulations message should appear. Nest has created step by step instructions which you can find here. There are 10 steps to the set up. Step 8 Power on your Nest Cam. A blue light will be on display. You are now ready to install it.